Chauve-souris - Dictionnaire Visuel - Copyright © 2005-2016 - Tous droits réservés. 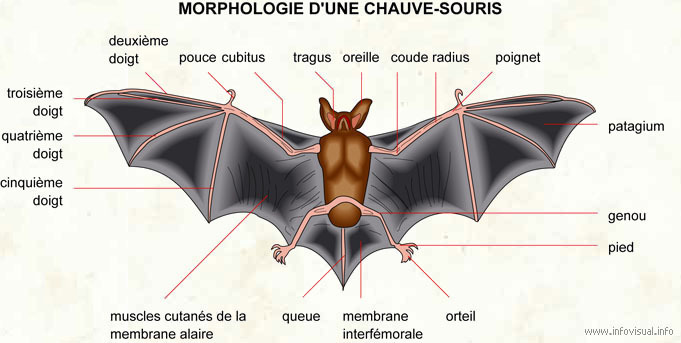 [img]https://infovisual.info//storage/app/media/02/img_fr/064 Morphologie chauve-souris.jpg[/img] [url=https://infovisual.info/fr][/url] - [url=http://www.infovisual.info/]Dictionnaire Visuel[/url] - Copyright © 2005-2016 - Tous droits réservés. Morphologie d'une chauve-souris: mammifère insectivore volant pourvu d'ailes membraneuses. Deuxième doigt: deuxième appendice articulé de la chauve-souris à partir de la tête. Pouce: premier appendice articulé de la chauve-souris à partir de la tête. Cubitus: un des os du bras de la chauve-souris. Oreille: organe de perception des sons. Radius: un des os du bras. Poignet: articulaton entre le bras et les doigts de la chauve-souris. Patagium: membrane formant l'aile de la chauve-souris. Pied: extrémité de la patte qui sert à agripper. Orteil: appendice articulé de la patte de la chauve-souris. Membre interfémorale: peau reliant les fémurs. Muscles cutanés de la membrane alaire: organes musculaires situés à la surface de l'aile. Cinquième doigt: cinquième appendice articulé de la chauve-souris à partir de la tête. Quatrième doigt: quatrième appendice articulé de la chauve-souris à partir de la tête. Troisième doigt: troisième appendice articulé de la chauve-souris à partir de la tête. Bats is a mammal in the order Chiroptera. Their most distinguishing feature is that their forelimbs are developed as wings, making them the only mammals in the world naturally capable of flight. There are estimated to be about 1,100 species of bats worldwide, accounting for about 20 percent of all mammal species. About 70 percent of bats are insectivores. Of the remainder, most feed on fruits and their juices. Only three species sustain themselves with blood, some preying on vertebrates: these include the leaf-nosed bats of Central America and South America, and the two bulldog bat species, which feed on fish. At least two known species of bat are cannibalistic, feeding on other bats: the Spectral Bat, also called the American False Vampire bat, and the Ghost Bat of Australia. By emitting high-pitched sounds and listening to the echoes, also known as sonar, microbats locate prey and other nearby objects. This is the process of echolocation, an ability they share with dolphins and whales. Two groups of moths exploit the bats' senses: tiger moths produce ultrasonic signals to warn the bats that the moths are chemically-protected (aposematism) (this was once thought to be a form of "radar jamming", but this theory has been disproved); the moths Noctuidae have a hearing organ called a tympanum which responds to an incoming bat signal by causing the moth's flight muscles to twitch erratically, sending the moth into random evasive manoeuvres. Although the eyes of most microbat species are small and poorly developed, leading to poor visual acuity, it is incorrect to assume that they are nearly blind. Vision is used as an aid in navigation especially at long distances, beyond the range of echolocation. It has even been discovered that some species are able to detect ultraviolet light. Their senses of smell and hearing are excellent. The teeth of microbats resemble those of the insectivorans. They are very sharp in order to bite through the hardened armor of insects or the skin of fruits.